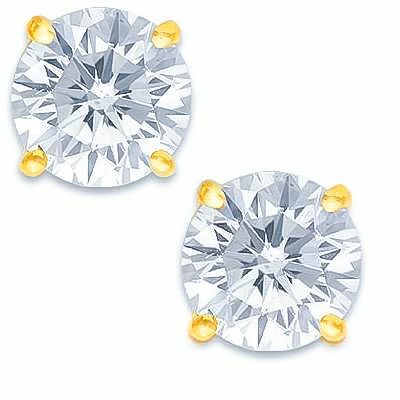 These Limited Edition 1.25 carat each round cubic zirconia stud earrings are set in classic four prong basket settings available in 14k white gold or 14k yellow gold. 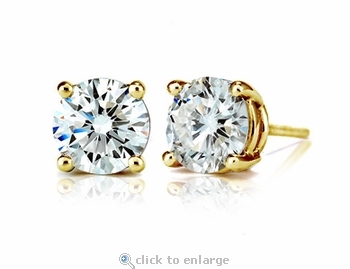 The total carat weight on these lab created round diamond look stud earrings are 2.50 carats twt. They measure 7mm round in diameter and are made from the finest laboratory grown diamond quality Russian formula hand cut and hand polished cubic zirconia. The four prong basket setting allows for the earrings to have a low profile and lets the most light enter the earring to provide the maximum brilliance for the diamond look stones. 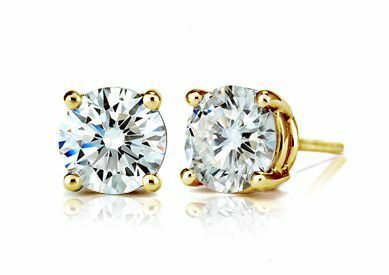 Standard earring posts and push backs are what come with these cz stud earrings and extra large jumbo earrings backs are also available via an upgrade, see the menu options. 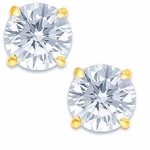 If you would like to order these earrings in 18k gold, rose gold or Platinum, simply call us or live chat with a Ziamond cubic zirconia specialist for assistance.